“Rhubarb?” a friend asked as he watched me cut the long red stalks. “Almost looks like rhubarb, but this is chard, called rhubarb chard because of its red stems,” I explained. I was cutting enough leaves for a veggie dish at an informal summer dinner we’re having this evening. How many leaves? Some are large, some medium, some small, so I’m cutting “about enough.” You’ll know what that means if you are an intuitive cook or have long experience with chard and how much your friends will eat. The dish is a simple one that I’ve adapted and simplified over the years. I wash the chard well to remove any grit. I rip the leaves from the stems and cut the leaves into narrow strips. I select some of the better-looking stems and cut them into inch-long pieces. I select one of our largest frying pans because the leaves will be quite a pile before they cook a few minutes. I begin sauteing the stems in a little high-quality olive oil. I add a thin-sliced red onion and continue frying the mix a couple of minutes. I then pile in the cut leaves and a couple of tablespoons of water, if I think it’s needed, and a dash of salt. Since the leaves will cook in just two or three minutes, I continue moving them around so they’ll cook but not overcook. At the last moment I toss in–surprise–a couple of cups of cooked and julienned beets, a handful of pecan pieces, a clove of minced garlic, and the juice of half a lemon, and bring everything to a simmer again. I then turn the beautiful veggie dish—which I call “Two Cousins & a Nut”—into a serving dish and highlight it with crumbled feta cheese. The “two cousins,” of course, are the chard and the beets. Yes, the beets are from my garden too. I pulled and boiled them last night. The “nut,” of course, refers to the pecans—well, I hope that’s the reference. I pulled them out of our freezer. Chard, of course, isn’t the most popular “cool weather” green veggie. Spinach wins that contest. But chard’s my choice and it’s commonly available in supermarkets and at farmers’ markets. Swiss chard, with pale green stems, is the “classic.” Rhubarb chard, with red stems, is my favorite. “Bright Lights” is a newer mixture with bright stems ranging from light green to yellow to red. Chard appreciates a start in cool weather but manages our hot, humid summers quite well. It occasionally survives a warm winter, and the roots the second year evidence their beet cousinship, though I’ve never thought to sample a root. 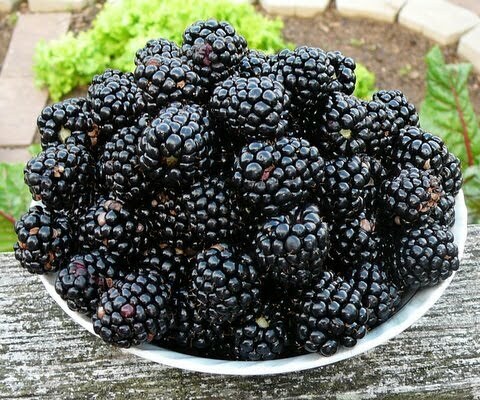 After I cut the chard, I picked a bowl of Triple Crown blackberries—the first significant picking of the year. Ellen has selected the best that we’ll use to make a halo around the top of the fruit salad we’ll put together for dessert. But, hey, company’s coming. I’d better get ripping and cutting the rhubarb chard. Wish we were there to enjoy these treats! They sound GREAT to me! I LOVE your fresh garden veggies and the berries! Thanks for the recipe!